Hi and welcome to the Sale-a-Bration blogathon! If you have come to my blog from Theresa's site then you are doing it in the right order! 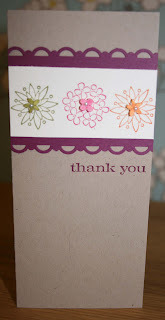 If not, then head back to Theresa for the start of the blogathon and some really gorgeous cards. Firstly, I apologise for the poor photography - it's something I need to improve on! 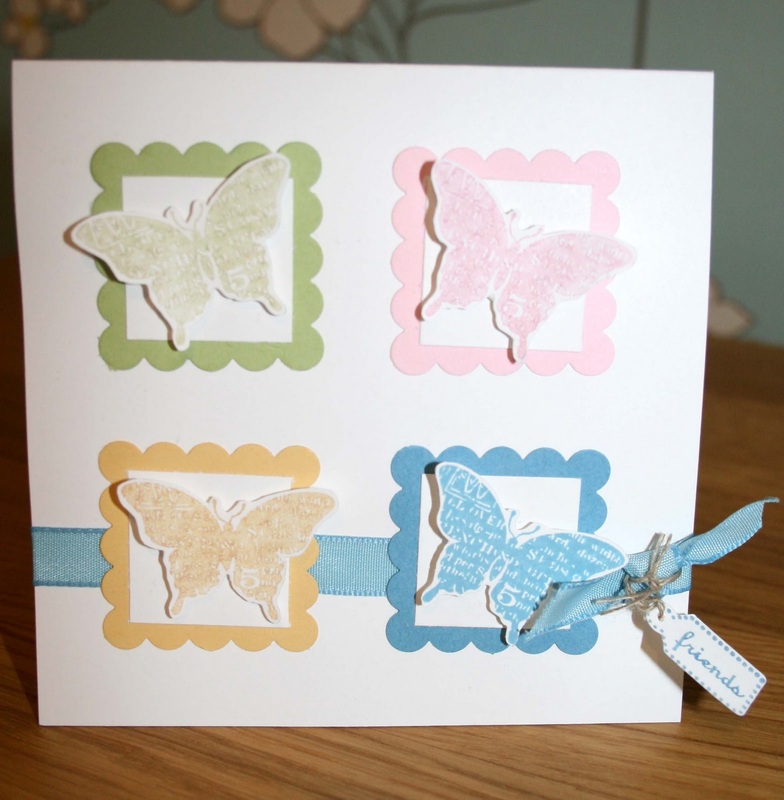 I've used the lovely Sweet Summer set for my first two cards. This has to be my favourite from the free sets, although they are all pretty cute! I've stamped the banner of Rose Red cardstock with the vine in versamark and then I've scored some lines two-thirds across. 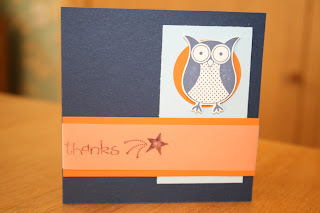 You could also use the Stampin' Up! paper crimper to do this for some added dimension. The vine in the main image has been stamped with Certainly Celery and then I've gone over the stamped image using the same ink but with my blender pen. The seed head flower has again been coloured using those fabulous blender pens, and mounted with dimensionals. For an extra little touch I've added a button from the neutral set and added a tiny tag. I just love Tiny Tags, it's one of those sets that at first I wasn't sure I'd use, but now it's one of my most reached for sets. 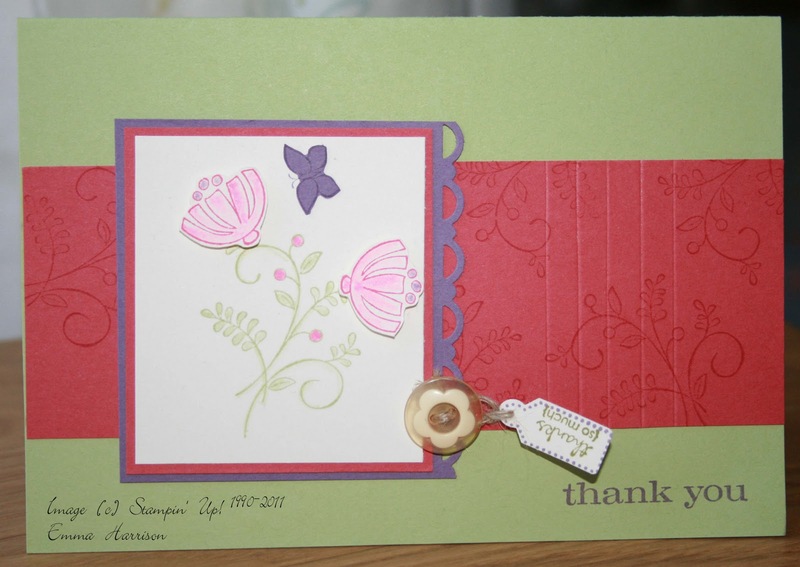 The second Sweet Summer card is a nice simple card that just uses the three flower heads, with a tiny flower added with a dimensional, and of course decorated with a tiny basic pearl. Bliss! How gorgeous are these little butterflies?! And my final for today is one that was inspired by one of Mary Fish's cards, I've just shrunk it down a bit. 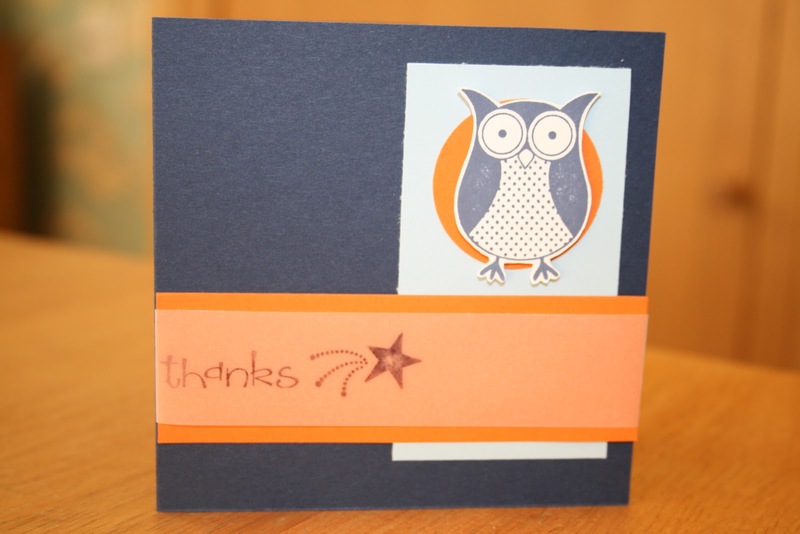 I love this colour combination of Concord Crush, Pumpkin Pie and Bashful Blue. Thank you for visiting. I hope you've enjoyed the cards and find lots of inspiration on the blog hop.The next person in the link is the super-talented Natalie.So head over to her blog for some gorgeous cards. There are four rounds in this blogathon, I'm part of the second group. Round one starts over on Sara's blog. Round three starts with Keren's blog. Round four starts with Kirsteen's blog. A great set of cards Emma. They're all lovely but I especially like the second thank you card. Simple enough for beginners but so striking. Gorgeous. 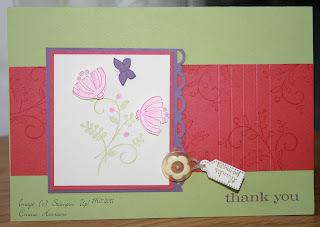 Emma, this is my first time on your blog and your cards are gorgeous. Thanks for sharing. Love the cards. My favourite is the Sweet Summer thank you card. What a great idea to cut out sections in solid colour!